Experience breathtaking vistas in private and quiet location. Recently renovated from top to bottom, with all new furnishings and contents. There are all the amenities you would expect at a major resort, three pools, two new restaurants.....Enjoy our peaceful nature trail and its gazebo with rocking chairs where you can relax while taking in the breathtaking views of the Virgin Islands. Great location on the northeast end of the island. Close to Red Hook ferry terminal for St John day trips, or dining out at many of the fun restaurants this area can offer. Several beaches nearby to swim & snorkel. I have supplied La Dolce Vita with everything I think you would need while on vacation. Much like home, with all those extra amenities you want: free WiFi, plenty of towels, beach chairs and beach towels, and cooler. Masks and fins available upon request. I will be glad to assist in any way I can. Local Activities: Day sail trip, powerboat rental in Red Hook. Visit Coral World, a short walk from our beautiful resort. Check out all the fun things to do in nearby Red Hook Marina, just 2 miles East. Take the ferry boat from Red Hook to visit St John and its National Park. The visitor center can supply maps & info for the hiking trails, sugar mill ruins, and underwater snorkel trail at Trunk Bay. Spend a day at world famous Magens Bay Beach or at Lindquist Beach in Smith Bay park located only one mile from the condo... spend time reading your book, relax in your beach chair. Drive into the historic downtown area of Charlotte Amalie. Take a walking tour of the many beautiful spots, one of the oldest synagogues around, the Moravian Church, the Old Fort, 99 steps, and much more to see. Enjoy duty free shopping!! I have been traveling to the Caribbean for the past 6 years and knew from the very beginning that I wanted to own a little piece of paradise of my own for vacationing with friends and family. I didn't do an exhaustive search because I fell in love with Point Pleasant the first time I stayed there. When the right unit became available I pounced and couldn't be happier. For now, I will use it as a vacation spot, but ultimately I see it as a stepping stone into retirement in paradise. 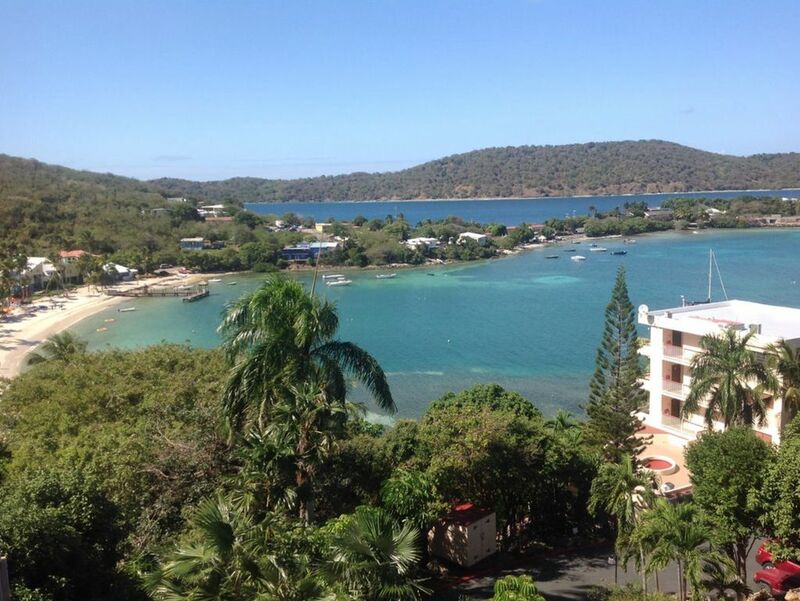 My condo is located within a four star rated resort on a beautiful hillside setting on the east end of the island. The units are thoughtfully situated to provide a feeling of privacy and so that guests can take in the beautiful scenery. Located near the ferry dock at Red Hook, excursions to other islands are very convenient. The trade winds blow most of the year making it comfortable even without air conditioning most of the time. Housekeeping services and laundry available upon request for stays longer than 1 week at an additional charge. Access is via one flight of stairs from the parking area.